Where do you see BMW of North America in five years? I see it as a different blend with most cars at the lower end of the spectrum but still premium. This will be a shock to some because many will be front-wheel drive. We are geared for the higher volume because dealers have invested a lot. We have bigger and better showrooms. 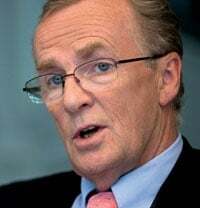 Jim O'Donnell took over as CEO of BMW (US) Holding Corp. in 2008, at the beginning of the industry's worst sales slump in recent history. BMW Group was coming off 16 straight years of increases in the United States. Now it is recovering from a 20 percent sales drop in 2009. O'Donnell says BMW Group's U.S. sales will be up about 10 percent this year, and he expects BMW to pass Lexus to become the top U.S. luxury brand by 2012. Over the next five years, BMW will introduce smaller cars, an electric plug-in and front-wheel-drive cars in the United States. But whether O'Donnell will be around for the changes isn't clear. In December he turned 60, BMW's mandatory retirement age. He says his three-year contract, which was to end in 2010, has been extended, but he won't say for how long. O'Donnell was interviewed at BMW North America's headquarters in Woodcliff Lake, N.J., this month by Staff Reporter Diana T. Kurylko. What is your outlook for the industry and for BMW for the rest of the year? The market will be up about 10 percent for the year, and I'd like BMW [Group] to be in line with that. If you look at the way the year started off, we are tracking a bit behind the market. April was OK. The underlying trend was stronger than last year. [BMW brand was] up 10 percent, and Mini was up 5 percent. The 5 series was down 2,000 units. What do you expect from the new 5 series that debuts this spring? It's our most important car, profitwise. It's been highly acclaimed across the world. We can't wait until it arrives. The competition and the E class are doing very well in this market and just seizing our share. You priced the new 5 series aggressively. Was that because Mercedes lowered the price of the E class? Yes, we wanted to be very competitively priced. We had no choice. The 535i is $1,650 less than the 2009 model, and the 550 is $900 less. The good thing when you reposition a vehicle is that you may attract more people into that segment. Is BMW benefiting from Toyota's woes -- and the Lexus SUV recall specifically? Are potential Lexus buyers coming to you? No, I don't see any evidence at all. There isn't a lot of cross-shopping from BMW to Lexus, but we do get people moving from Lexus to BMW. Why does BMW think a front-drive car slotted below the 1 series will sell in the United States? Our engineers will make it the best front-drive car available. The average consumer won't know if it's front-drive or rear-drive or really care as long as the package is good. And we need it because the government has given us a 35.5-mpg fleet requirement by 2016. This is part of the plan to get there. Last year our car fleet averaged 29 mpg, better than required, and trucks were 22.7 mpg, 0.4 below. When will we see four-cylinder engines from BMW in the United States? The four-cylinder will come out some time next year, and it will produce better fuel economy, lower emissions and better power than the corresponding six-cylinder. When will we see the X1 crossover? Do you see four-cylinder engines being offered across the range -- other than the 7 series? I see it as a possibility in most cars, although perhaps not in the 6 series either. You'll launch three smaller crossovers/SUVs late this year and early next year -- the X3, X1 and Mini Countryman. How do you keep from confusing the buyer, and how will you stagger the launches? The plan is to start with the X3, which is almost the size of the original X5. The Mini is in between, and it's a separate brand. In March, the plan is [to launch the] X1. There is quite a difference between the X3 and the X1, and that's evident when you show them together. What do you expect from the X1? I don't have big targets for the X1. It won't be a volume car. It will be priced lower than the X3. We will price according to volume aspirations. We think we will attract people from the 1- and 3-series segments. No one else has this offering in the marketplace -- not in the luxury segment. I don't think it will be soccer moms but empty nesters or sporty people. Your diesel sales have picked up. What percentage of U.S. X5 and 3-series sales are diesels, and what do you expect in the future? They have been doing very well. The diesel has been 28 percent of the X5 volume; and the 3 series, about 6 percent. The bigger the car, the more diesel makes sense. Will you offer diesel in the new X3? Not at launch, but we're looking at it. When do we see more diesel engines and in what cars? I am doing a board presentation in July, and we'll make a decision then. It will [not be on] the entire passenger range. It makes more sense on the larger cars and X vehicles. Premium buyers will buy diesel; they are more open-minded. You've tested the plug-in electric Mini E for a year with lessees in California, New York and New Jersey. You'll run a trial with the 1-series based ActiveE in the United States next year. How will you apply those lessons, and how long before you have a production plug-in vehicle? We are going to extend Mini E lease contracts for another year for people who want it. The Mini E has been surprisingly successful, and people who have them love them. Once we got over the infrastructure issues in the first few months, it's been a real success. It will help us do an even better job with the ActiveE. In 2013, we get the Megacity vehicle. Will the electric Megacity be a microcar just for cities, as small as the Smart car? It will be more than an urban small car. It will have the powertrain of the ActiveE. The Megacity vehicle will be able to seat four adults. Is BMW luring conquests with the 550 GT crossover, or are buyers downsizing from the 7 series? We don't know yet on the conquest side, but I have been surprised how many 7-series customers bought it instead of another 7. We don't have enough detail yet. They like it because of the height and the interior is similar to the 7 series. It is running 20 percent behind budget at the moment, and the reason is we were too ambitious with the 550 GT. I believe this time next year we'll tell you if it's successful or not because we don't bring the 535 all-wheel drive until fall. The 550 all-wheel drive goes on sale in June. We have sold more 550 GTs than we sold 5-series wagons last year. We sold about 900 5-series station wagons last year. No, pricing is an issue because there was only the 550. It is 5 percent above the equivalent 5 series. Worldwide, it is running ahead of budget. They have been selling the 535 since last fall. Do vehicles like this have a future? What about a 3-series GT? I think they have a future. You will always learn with the first incarnation and tweak it when you come out with a second generation, but I am very confident there will be a second generation. We need to examine the marketplace. Generally speaking, all of our competitors have followed us into all the niches we had. Some took years. Now that they are there, we need to develop more niches. Would a smaller version of the X6 make more sense than a 3-series GT? The X6 has surpassed our expectations -- double what we originally thought in terms of segment share. We're closing in on 100,000 vehicles in two years. We only offered it with two rear seats, and we have changed that and will offer an optional bench seat, but not in the 2011 model year. We would have sold more cars if we had the bench -- it will be 70 percent of the volume. The consumer wanted that, and we thought he didn't. Why did that vehicle take off more than the 550 GT? The X6 is all-wheel drive, and the bulk of our market is the Northeast. What is the average dealer return on sales? They ended the year with 2.4 percent -- that's good in the worst recession we've ever had. The dealers responsible for 50 percent of the volume had a return of 4.0 percent.